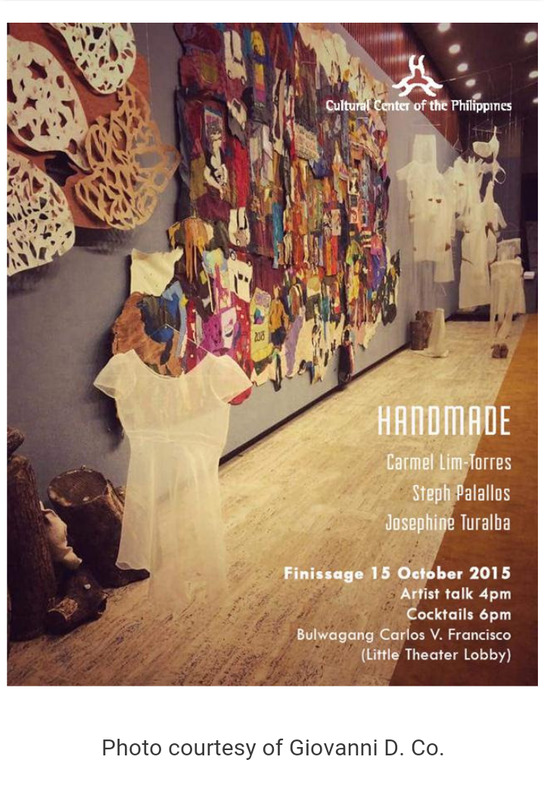 For their exhibition finissage, the artists of HANDMADE will have a special artist talk and closing cocktails on 15 October 2015. It will begin with an introduction by exhibit curator Leo Abaya, which will be followed by the artist talks of Josephine Turalba, Steph Palallos, and Carmel Lim-Torres. In their exhibit, Palallos, Lim-Torres, and Turalba create diverse art highlighting the Handmade. They express personal experience rather than give voice to a collective social message. Consider Turalba’s leatherwork as a means to re-imagine landscapes from memory, or Palallos’ sewing fabric to construct garments that expose the ailing body, or Lim-Torres’ embroidery applied to paper, ceramics and wood to express hope amidst ecological peril. Handmade is on view until 18 October 2015. Viewing hours are Tuesday to Sunday, 10am to 6pm. The exhibition is supported by Active Group Incorporated, Pepi Cubano, Tacos Chingones, and Delbros Group. Photo is courtesy of Giovanni D. Co.